Ellen Potter, author most recently of Piper Green and the Fairy Tree and its sequel Too Much Good Luck, invites us along as she relives a unique author tour through the world of her stories. And, more ominously . . .
As a children’s book author, my days often consist of sitting alone in a room, anxiously ripping my cuticles to shreds while struggling to conjure worlds out of thin air. I’m not complaining, mind you. I feel ridiculously fortunate to be making a living as a writer. Still, when the opportunity arises to step away from my desk and pursue one of my most enduring passions—inspiring kids to write—I’m all in. 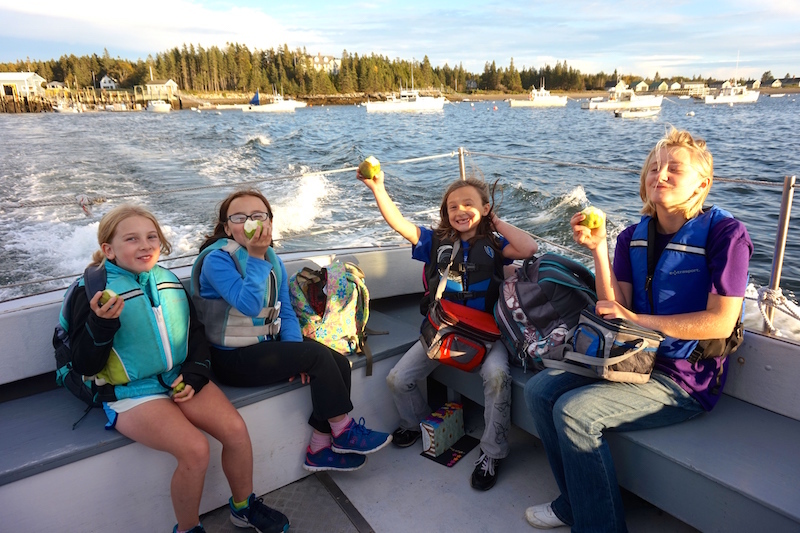 Several months ago, Island Readers & Writers, a Maine-based organization that provides literacy programs for children who live on Maine’s islands, approached me with an enticing new idea: they wanted to send an author to sail on a ship for 3 days, stopping at several remote islands to do author presentations at one-room schoolhouses. Would I be interested in being their first author in the program? Oh, and I could bring my husband and son along too. Despite the warning of rough seas and impossibly tiny schools, I jumped at the chance. The timing couldn’t have been better. I was just about to launch Piper Green & the Fairy Tree, an early chapter book series. It is about a girl growing up on a tiny Maine island who goes to school via lobster boat and finds a magical tree in her front yard. 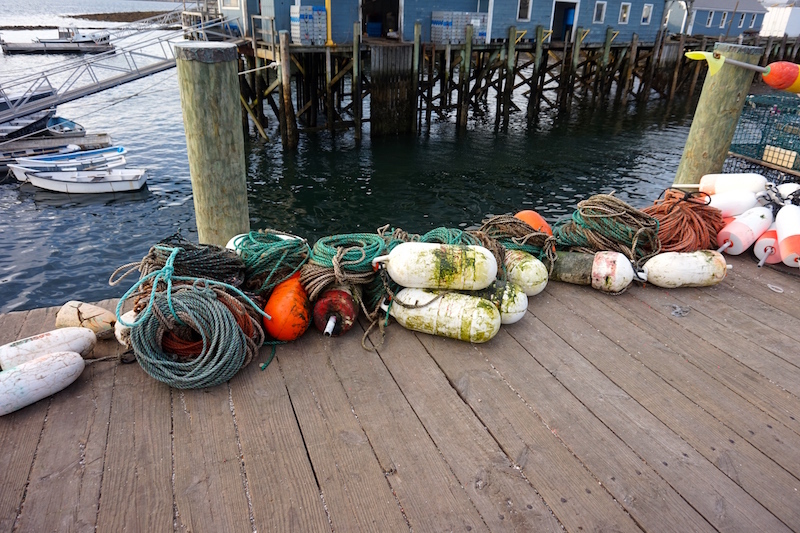 I was eager to meet the island children, as well as their parents, most of whom earn their living by lobster fishing. As the date for the trip approached, however, I started feeling jittery. It wasn’t just the seasickness that worried me. 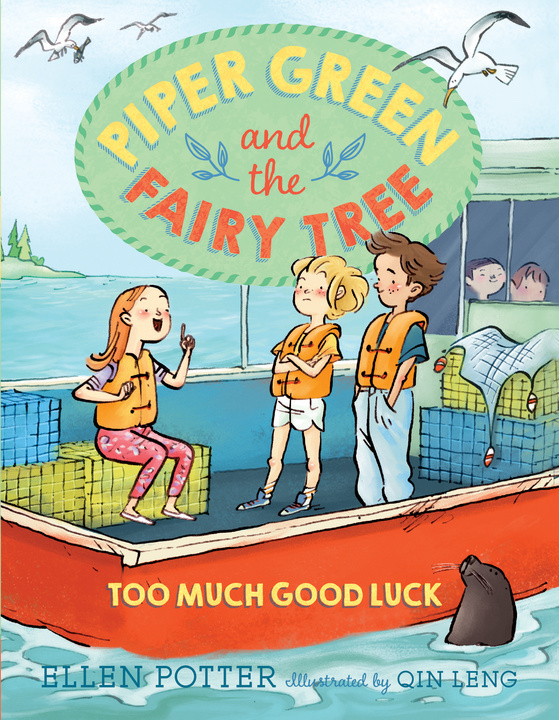 I was also nervous about meeting the islanders, who would have read Piper Green & The Fairy Tree. After all, I was writing about their lives . . . the joys and challenges of living on an isolated island. Full disclosure, I’ve never lived on an island (unless you count growing up in Manhattan). 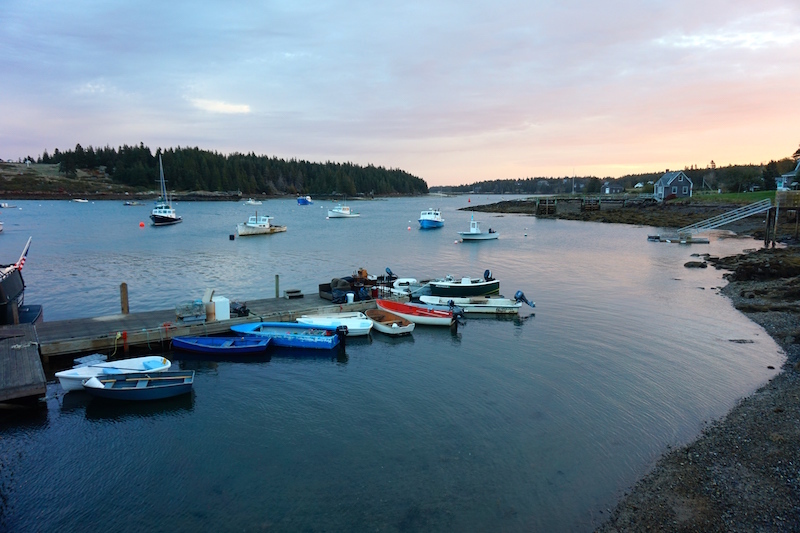 Yes, I did an awful lot of research about island life, and I do live near the islands themselves, in a tiny coastal village on a Maine peninsula. And sure, if I had made any major blunders, 99% of my readers wouldn’t be any wiser. The islanders, however, would definitely catch any mistakes, and since they have a reputation for being forthright, I was pretty sure they were going to let me know about them. 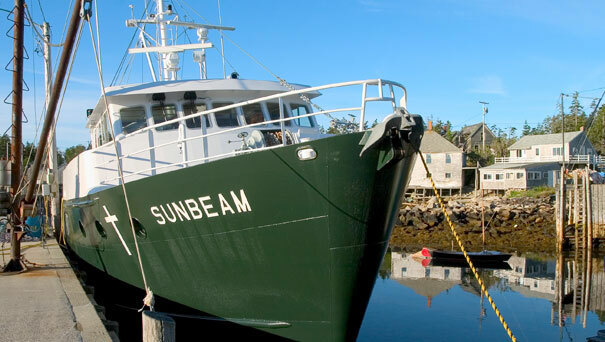 A few weeks later, after stocking up on Dramamine, my family and I boarded the Maine SeaCoast Mission’s Sunbeam, a 75-foot-long ship that provides medical help, youth outreach, and other services to island communities. The Sunbeam was lovely with a large, well-stocked galley (the islanders look forward to the Sunbeam’s visits for many reasons, not least of all their phenomenal baked goods), a dining area for the islanders to have community meals, and a nurse’s station for remote doctor visits. After a good night’s sleep—the little cabins were surprisingly comfortable—we sailed over to the first island, then hopped on a mail boat to get to the island schoolhouse. To my delight, sitting across from me were four little girls in brightly colored life vests on their way to school. 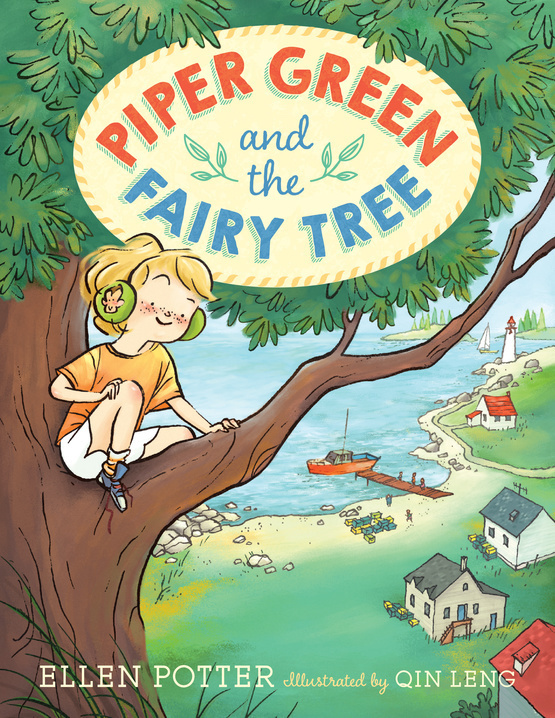 Oh my goodness, I thought, it’s exactly how I had imagined Piper’s daily ride to school in Piper Green & The Fairy Tree! How peculiar for an author to see their inner vision appear right in front of them. Have a look . . . below is the cover of the second book in the series. And here are the real island girls on their boat ride to school. Up until recently, my idea of a one-room schoolhouse came straight from Little House on the Prairie. Remember those big thugs in Farmer Boy who sat in the back of the classrooms, plotting to beat the snot out of their teacher while the terrified little kids sat up front? I remember being appalled when I read that part of the book as a child. Imagine being in first grade and having classmates who were already growing beards. 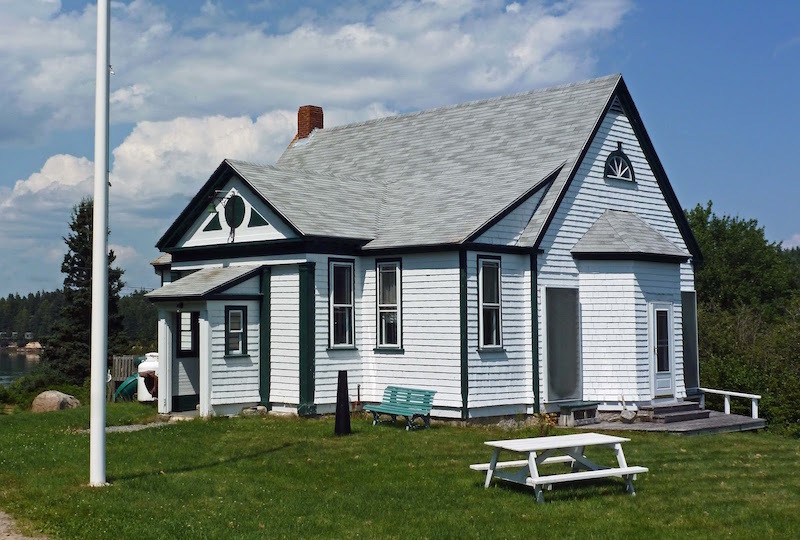 But the one-room schoolhouses that I visited on the islands put those old notions to shame. The teachers told me that the older kids, or “olders” as they call them, watch out for the “youngers,” and that the students relate to each other more like an extended family than simply classmates. The olders naturally assume a leadership role for the youngers, while the youngers are included in the olders’ activities. I actually saw this in action at one of the biggest island schools (17 kids total, in K-8th grades). After my presentation and some writing workshops, we went outside for recess, and I watched as one little boy took a spill on the playground. His face crumpled up as he got ready to wail. Instantly, several of the older kids swooped in and included the little boy into their game of Four Square. Crisis averted. A seasoned parent couldn’t have handled it better. I suppose the school I was most curious about was the last one we visited, in which there were just two 8th grade boys. How on earth does that work, I wondered? Don’t the boys get bored of each other’s company? And what the heck does gym class look like? In fact, the school operated very much like a larger school, with a structured, curriculum-driven routine. The two boys were both very bright and enthusiastic but as different from each other as chalk and cheese. Perhaps in a larger school they wouldn’t have been friends— one boy hunted in his spare time and wanted to become a lobsterman; the other boy was an inveterate reader, who had an eye toward moving to a city one day—but in the classroom they acted as a team. According to their teacher, one of the skills that kids in tiny schools develop is the ability to get along with others. When there are only two kids in the school, or even 50, there’s little room for petty conflicts to fester. You need to learn to work things out, which may arguably be one of the most important skills a person can acquire in school. And gym class? Well, team sports were clearly not on the menu, but a local man was in the process of teaching the boys croquet. As for my pre-trip jitters . . . happily, I didn’t get seasick despite some rough seas. Even better, the islanders did not find any major blunders in my books. In fact, they were thrilled that one of my subplots dealt with a particularly knotty issue that nearly all Maine island kids struggle with: once children graduate from 8th grade, most will need to go to high school on the mainland. Although some children can commute, many can’t. That means that either the whole family has to move off the island or the child has to leave home. Some of the kids board with other families on the mainland or occasionally at the high school itself. Imagine being 14 years old and not only leaving your family, but also going to a school in which there are more kids in a single class than there were in your entire island school (and sometimes on the entire island itself). It is undoubtedly one of the most stressful transitions for young islanders and their families. Ellen Potter examines the island children’s fairy houses. There were so many memorable moments on our trip, but one of my favorites happened on Frenchboro Island. 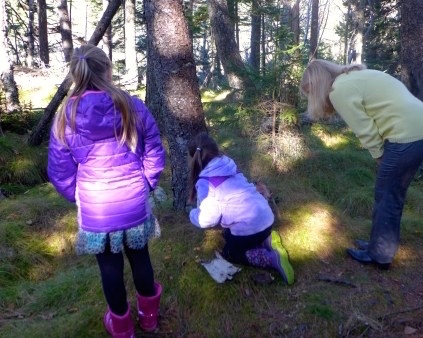 The three little girls who comprise the entire student body at the Frenchboro Island School took us for a walk in the woods to show us their fairy houses. The woods were mossy and green, with rivulets wending through it. We carefully walked across wooden planks spanning shallow gullies while the girls chattered excitedly about their fairy houses. The two older girls showed us what they had built—a fairy town with its own post office and fairy general store. It was pretty impressive. We started to head back to the school to do some writing when the littlest girl said that she wanted to show us her fairy house ,too. We followed her through the muck of damp, fallen leaves until she stopped at the stump of a tree. I looked. Then I knelt down and looked harder, because I really wanted to see her fairy house. “Where is it?” I asked her. “It’s right there,” she insisted, pointing fervently at a spot on the ground. “I don’t see it,” I admitted. “That’s because I haven’t built it yet,” she answered. I smiled. Though this little girl had not yet mastered the art of tying her shoe, she had discovered one of the great secrets of writing—to vividly see the unseen. To conjure worlds out of thin air. Ellen Potter is the author of many award-winning children’s books, including the Olivia Kidney series, SLOB, The Kneebone Boy, and her new early chapter book series, Piper Green and the Fairy Tree (Knopf). She lives in a small coastal village in Maine with her family. Ah, Ellen. How great that you shared your delightful experiences in Arthur’s home turf. You are blessed and so are the children in Maine and all over the country who have access to your books. Couldn’t agree more! I love Ellen’s stories and appreciated them even more having read of this great experience from Ellen! Thank you, Hope! I do feel very lucky!